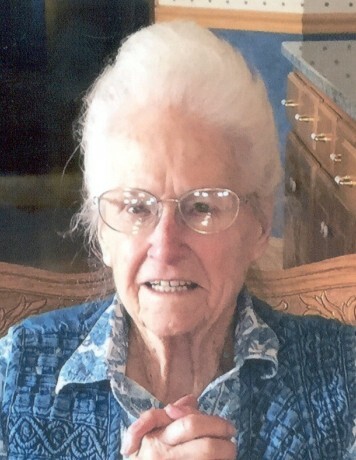 Nellie M. Liberty, 95, of Gower, MO (formerly of Falls City, NE) passed away January 16, 2019 at St. Joseph, MO. She was born on March 12, 1923 at Reserve, KS to Forrest and Ruth (Metzger) Johansen. She married Richard W. Liberty on May 22, 1941 at Hiawatha, KS. He passed away September 23, 2011. Nellie was raised in Reserve, KS and graduated from Reserve High School in 1941. When married the couple established their home south of Reserve and then moved into Preston, NE in 1950. She was a homemaker her entire life. She moved into Falls City in 2013 and then to Platte City, MO to be with her daughter in 2015 and then to the nursing home in Gower in 2018. When living in Falls City she attended the First Church of the Nazarene and while in Gower she attended Faith Baptist Church at Smithville, MO. Nellie is survived by her daughter, Barbara Ise of Kansas City, MO, sons, Richard and his wife Barbara of Ankeny, IA, Gary and his wife Cathy of Falls City, Dennis and his wife Jean of Ankeny, Roger and his wife Joni of Hemple, MO, Neil and his wife Jeannette of Holdrege, NE, brother, Bob Johansen and his wife Darlene of Hiawatha, nineteen grandchildren and many great-grandchildren. She was preceded in death by her parents, husband, brothers, Ken, Keith and Ed Johansen, sister, Betty Pape and a great-grandson, Easton Vonderschmidt. Her funeral will be held on Wednesday, January 23, 2019 at 1:00 PM at First Church of the Nazarene with Reverends Richard Lehmkuhl and Stephen Floyd officiating. Interment will be in Steele Cemetery.